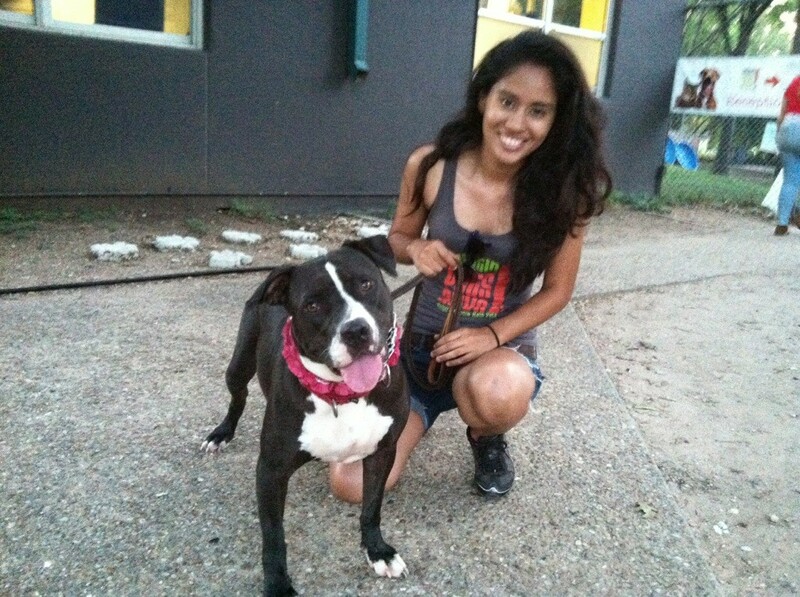 My name is Cassandra and I’m the Matchmaker at Austin Pets Alive!. This weekend has been the best of my life. A man and woman came into our shelter looking to adopt on Friday. The first thing they said was, “We are huge fans of pit bulls and need a new family member,” or something along those lines. They began to tell me and two of my coworkers of their past two dogs, one being a pittie, who both had passed away. They told us of their dogs’ lifestyle and funny quirks, everything. I immediately had Louise’s name popping up in my head, but I held back to see if these guys were the real deal. Louise has been at our rescue since November, 2011. I sat the family down with me and they pulled out a list of about 17 dogs, all of which being male “bully breeds.” So we went through and I gave them my personal experiences with every dog, along with each of their backgrounds. I had them sit in a pen and I brought in dogs one-by-one. I had my all-star team out for them: Ice, Romeo, Al Pacino, Scarlett, all my dogs that needed homes the most. And I brought my big, fat Hippo Louise. They fell in love. After showing them a good 15 or so dogs it was down to Henrietta, Blue, and Louise. They were having trouble to decide so I told them we would go into the Life Room, where they would be away from all the loudness of the shelter and get to truly be one-on-one by themselves. They crossed Henrietta out, so it was down to my girl and Blue. I brought in Blue before Louise, and left them alone to hang with him. I went to pull Mike Kaviani, our Behavior Team Manager, aside to talk to him about these amazing people. When they were done hanging out with Blue they were almost set on him. But then I brought my girl in. I had Mike come in and talk to them and get to know them. After about 45 minutes of conversation and feeling like I’m going to pee my pants with anticipation, the wife looked at her husband and said, “This is your girl isn’t it?” Mike and I looked at each other whale-eyed. I think his bladder felt the same as mine. They told Mike they wanted to work with him a bit to learn all she knows so they can continue giving her the best obedience. Mike and I tag-teamed with them for about two hours, talking to them about her, showing them her quirks and outstanding qualities she had. It was sort of like a Batman and Robin kind of thing. Him being the one that created her as what she is today (without him she would have never had a chance,) and me going for the gold in showing these people a dog that were not anything that they expected to get. Both of us also sneaking away calling all of our volunteers and staff to tell them of the amazing news. 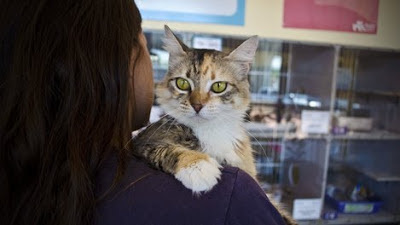 After 20 months of living in a shelter, Louise was getting adopted. I worked with these people for about six-and-a-half hours and they were not even looking for a female, nor a dog that needed to be an only child, but they gave her a chance. I didn’t show her to them because they were dog savvy, nor did I do it because they didn’t care about hospital bills or any other expenses, I did it because I knew for a fact that whatever dog I sent with them would be in their home forever. These were the kind of people that didn’t give up on their dogs. Dogs were family to them. The woman earlier in the day looked at me and said, “There’s a reason why dog is GOD spelled backwards. They provide you unconditional love and they are the closest thing on this planet that you will get to God.” She was literally a godsend. Louise has been the love of my life for a very long time and I can’t begin to relay how lucky and happy I am to have been a part of her life and help her find her forever home. 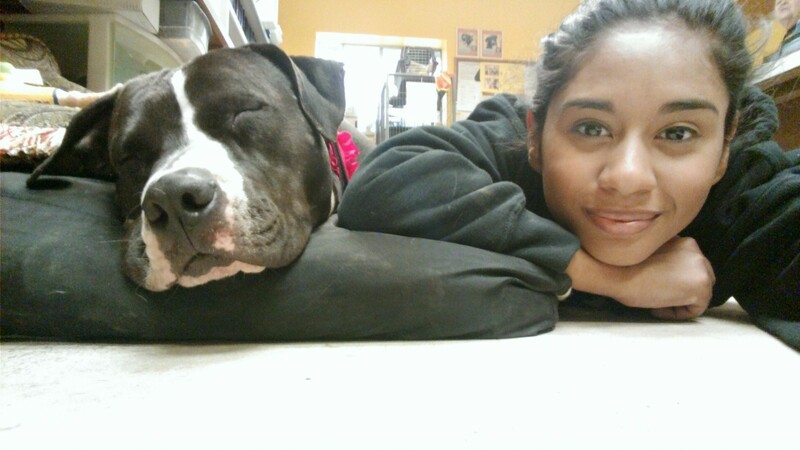 She is a true example of what we do at APA!. We gave her a chance when nobody else wanted to. I thank God for her and my coworkers and Mike every day. If it wasn’t for him and everybody else, I wouldn’t have had her in my life. I will think about that girl every single day. - Cassandra Olivo, Matchmaker, Austin Pets Alive! 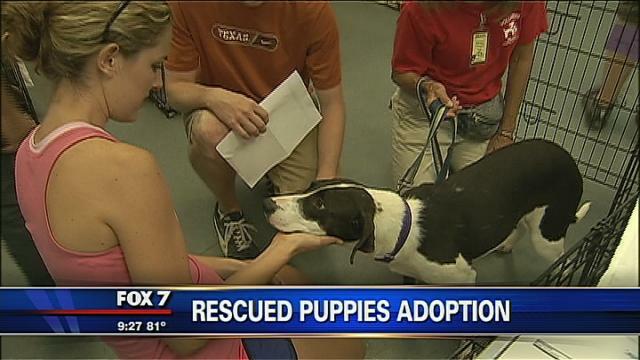 Earlier this week FOX 7 aired a story about 30 puppies rescued from a property in the Waco area. 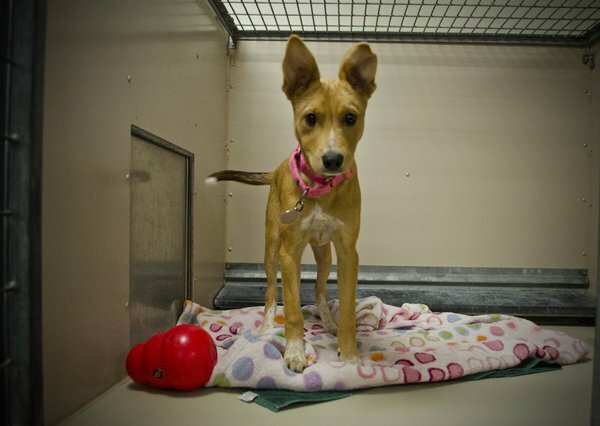 Saturday, two dozen of them went up for adoption at the Austin Humane Society and you, our viewers responded. People were lined up outside the Austin Humane Society Saturday morning. They were excited to get inside and meet 24 of the 30 dogs recently rescued from the Waco area. Oriana Rodriguez and Robert Mandujano were the first through the doors. They were watching FOX 7 Tuesday and spotted a pup named Turtle. They knew they had to have him. "When I saw him he was just so adorable," said Rodriguez. "We wanted a playful dog and he seems very playful." Since the hound, Labrador retriever and shepherd mixes were rescued, humane society staff have worked to get them all spayed and neutered, micro-chipped, vaccinated, de-wormed and treated for fleas and ticks. The dogs are ready to go straight into the arms of a new family. Employees say this was the biggest community response since animals were displaced in the Bastrop fire two years ago. "Just to see these families walk in and the kids, their eyes are glowing make contact with the dogs that are looking for their new homes and to see that reunion and that very moment. From that point all the way out into the parking lot when we say goodbye to the dog, it's perfect." One new pet owner is FOX 7's own photojournalist Andi. She, accompanied by daughter Hailey, adopted two-and-a-half month old Yogi. "It's great. It's great to see all of this," said Mandajuno. "I'm really glad that the guys here rescued them from Waco because they're giving him a second chance at life," Rodriguez said. If you weren't able to make it to the Austin Humane Society Saturday, you still have a chance on Sunday to take home one of the remaining nine dogs. The humane society will be open from noon to five. As cats get older they have special needs are requirements. 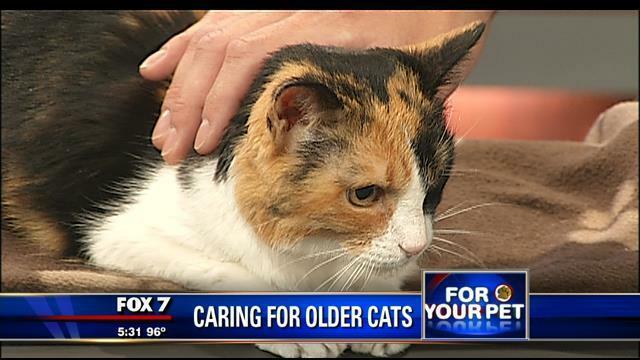 Dr. Jeremy Varga from Austin Veterinary Diagnostic Hospital says homecare for senior cats includes brushing their fur often, trimming nails, brushing teeth, provide fresh water, provide senior cat food, and make sure they have access to a warm bed and multiple litter boxes. He says owners should watch for appetite, water intake, litter box activity, mobility and overall behavior. Email questions or topic suggestions to fox7foryourpet@gmail.com. Austin has cats – a lot of cats. And in the absence of an ordinance that requires spay/neuter of pets, there are a lot of reproducing cats out there, many of them stray and/or feral. Year in and year out, the large free-roaming cat population remains a big problem in the city of Austin, local animal welfare advocates say. And when you consider how quickly cats reproduce – they mate during warm months (so, you know, most of the year) and a female can become pregnant while still nursing – two cute strays can become dozens in short order. In an effort to curb Austin's feral cat population, the Austin Humane Society has since 2007 operated a free Trap-Neuter-Return program. T-N-R is a volunteer-led effort to trap strays and ferals, get them to the AHS clinic to be fixed (dewormed, given shots, and to have one ear "tipped" so that they can be identified from afar as fixed) and then returned to the streets, where they often live in colonies – groups of cats that volunteers generally continue to feed and to tend to for years. Although there's no "kitty census," as AHS Executive Director Frances Jononputs it, the large number of cats that have come to the AHS T-N-R program over the last five years suggests how big the problem is: In 2007, the T-N-R program tended to more than 1,500 cats; the next year that number jumped to 5,000. 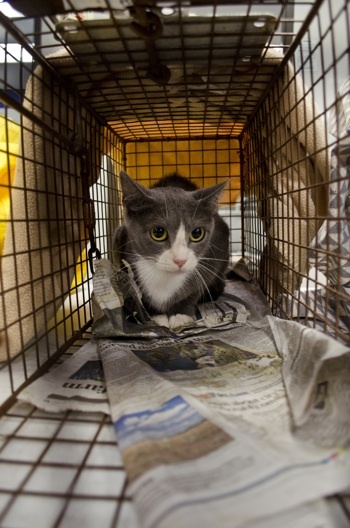 Next month, the AHS clinic will mark it's 25,000th feral cat surgery. "The problem," says Jonon, "is massive." Want to help? Contact Leticia Stivers, the AHS' feral-feline-whisperer – officially, the feral cat program supervisor – at 512/685-0111 or 512/968-7131. Your feline friends – and the birds and lizards in your neighborhood – will thank you. 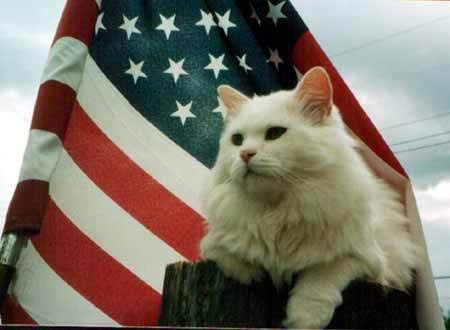 More on free-roaming cats here. More on the AHS program here. A panel of esteemed film critics met this week to select the "top dog" of the Cannes Film Festival. No, that's not a bit of fancy wordplay. They weren't there to give Quentin Tarantino some more awards to throw on the woodpile -- that happens during the Palme d'Or award. This is the Palm Dog award. Canis lupus familiaris. Best dog of the whole festival, the only award that really matters in some circles (like the one we're in right now). From where I sit (Michael Leaverton of Dogster), that's pretty esteemed. And who won the Palm Dog? Baby Boy, Liberace's partially blind Poodle in Behind the Candelabra! He gets to wear the trophy collar. We weren't lucky enough to see the Steven Soderbergh film when it aired on HBO this week, but Twitter went nuts over the film, so we're assuming that Baby Boy put in a stellar performance. Also, perhaps Matt Damon, Michael Douglas, Rob Lowe, and Dan Aykroyd carried some of the weight as well. Peter Bradshaw praised Baby Boy for exploring "a profound existential paradox," according to PawNation. In the film, Baby Boy is credited with bringing his teenage dog trainer (Matt Damon) into the embrace of Liberace (Michael Douglas). "He brought those boys together -- he has a lot to answer for!" said Palm Dog organizer Toby Rose. Oddly, we can't find a decent shot of the famed Baby Boy (save the one above), so we'd thought we'd leave you with this, a Poodle in sunglasses driving a car. Seems right. 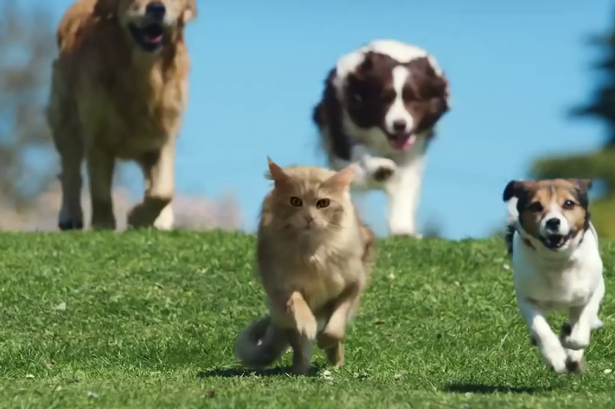 Rare recommended viewing: Ad features cat promoting "be more dog"
Owner Debi Krakar started Austin Dog Alliance after taking part in a German Shepard Rescue Program and certifying one of her dogs in Pet Therapy. She then worked diligently for four months trying to convince schools to let her test out her innovative dog programs. After one school finally obliged, her dream spread like wildfire. Before long, she knew it was time to venture into opening the non-profit business to share her programs — with four kids and five dogs of her own for inspiration. If you or your children are in need of some cuddly companionship... look no further than Austin Dog Alliance. They offer a wide variety of programs ranging from specialty events such as dog treat cooking classes to Autism summer camps. 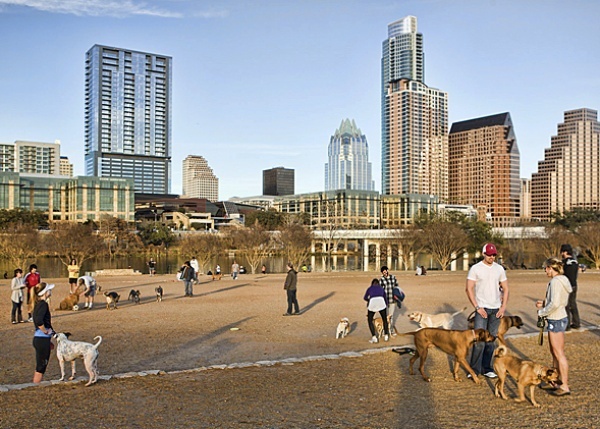 Krakar says that Austin Dog Alliance’s goal is to develop programs that incorporate dogs in order to improve peoples’ lives. Austin Dog Alliance has a total of 85 certified therapy teams which visit hospitals, schools, libraries and nursing homes. In addition, they have a program called Bow Wow Reading Dogs, which works in conjunction with schools. Bow Wow Reading Dogs provides animals to schools, so that students learning to read are able to read to the dogs. Krakar says this can take the pressure off of the kids and puts them at ease, unlike reading out loud in a classroom setting. 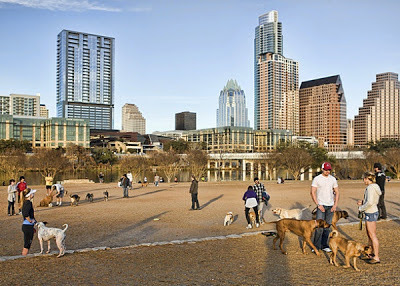 Another unique quality of Austin Dog Alliance is their Social Skills group class, which is available to children from elementary grade level to high school. Through the innovative use of dogs, kids are able to express themselves in a safe social context before having to face some of the harsh, clique-ish school realities. They also build empathy skills by learning how to read the dogs’ emotions and comparing it to humans’ emotions. For example, by viewing how a dog would react when their behavior strays from the norm they are able to determine how a person may act in a similar context. If you’re looking to adopt, Austin Dog Alliance has a specialized program that focuses on well-rounded dogs that will do well in homes with children. This correlates with their Special Dogs for Special Needs program, in which all dogs are taught basic commands before being placed in a home with a special needs child or adult. Both of these programs require community volunteers to foster the dogs prior to their adoption. 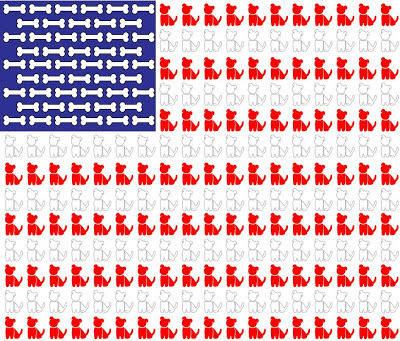 All of the rescue dogs brought to Austin Dog Alliance for adoption are from local shelters. 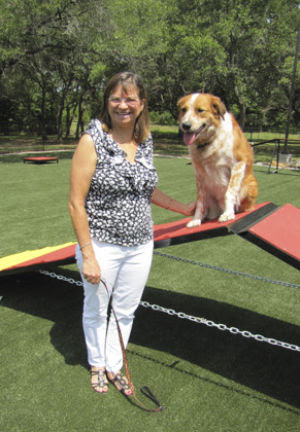 Krakar also says that Austin Dog Alliance plans to hire more people to meet the needs of the business and continue to settle in to their new location. AUSTIN -- In honor of the Independence Day holiday weekend, several Central Texas animal shelters are offering adoption deals. If you'd like to add a new furry friend to your family, take a look at the specials below. All ready-to-go cats and kittens and dogs four years of age and older beginning will be $4. The special begins July 4, and lasts until July 7. The shelter is open from 11 a.m. to 7 p.m. each day. The fee includes spay or neuter surgery, a microchip and vaccinations. 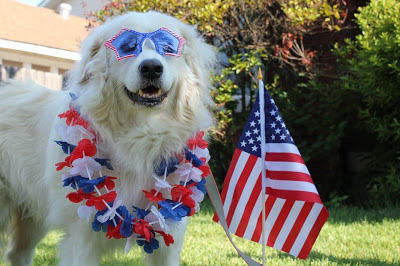 The Austin Humane Society is celebrating the July 4th holiday Friday July 5 through Sunday July 7 with an Adopt-a-Purrfect Patriot weekend. All kittens and cats will be free. Their adoption includes a spay or neuter surgery, microchip and vaccinations. The shelter is open Thursday, Friday and Saturday from noon to 7 p.m. and noon to 5 p.m. on Sunday. The Williamson County Regional Animal Shelter is celebrating all week with a Land of Free Adoptions event. All animals will be free. 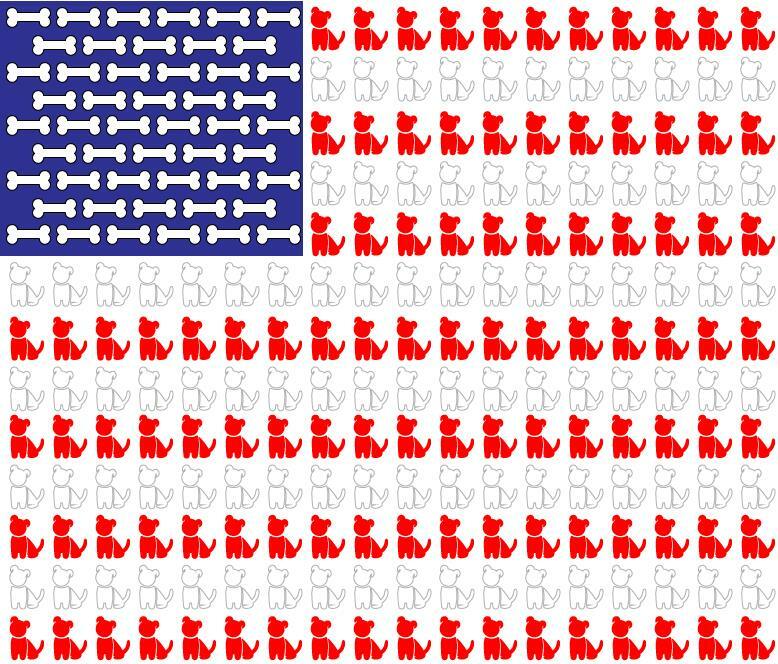 The shelter is open Thursday July 4 from 11 a.m. to 6 p.m., Friday from noon to 6 p.m., and Saturday and Sunday from 11 a.m. to 5 p.m.
AUSTIN (KXAN) - An off-duty Austin Police officer working security at a Petco near Lakeline Mall shot and killed a dog inside the store on Wednesday evening. According to police, a pit bull inside the store started attacking a smaller dog around 7:20 p.m. The owners were able to break-up the initial fight but a few minutes later, the pit bull was able to get away from its owner and attacked the smaller dog a second time. The female officer, who was in full uniform, pulled out her weapon and shot the pit bull; the dog died at the store. The smaller dog was taken by its owner to the veterinary for treatment, the extent of its injuries are unknown. Petco has not released a statement in regards to the incident.